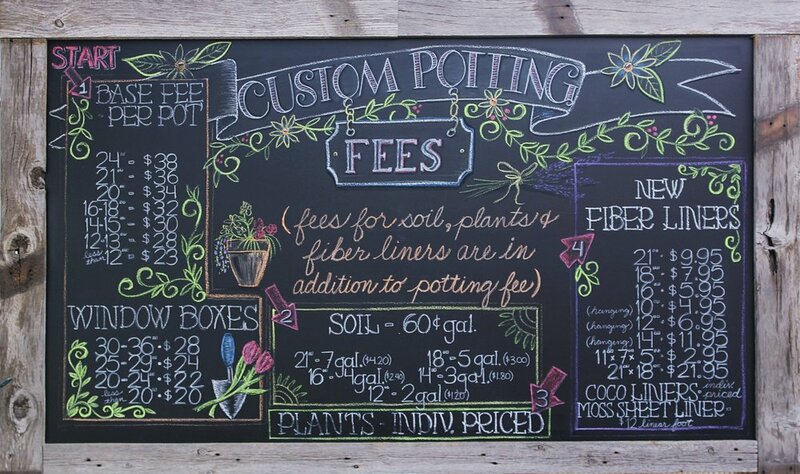 Our Custom Potting service is original and unmatched in the Treasure Valley. We have been creating custom pots for over 30 years. We work with you to create unique combinations, from a large selection of annuals, accent plants, herbs, vegetables, and perennials. We begin taking orders in early spring. Pots are planted and nurtured until it is safe to take them home. need help potting your new plants? Use our tools and supplies to make something here at the store. We have all the ingredients and advice you'll need. Pick out a pot or bring in your own, purchase some plants, and dig in. Soil can even be purchased conveniently by the scoop. Plan a planting party! We can host your group for a workshop party after business hours. Experience the joy of making something together and everyone will go home with a handmade garden craft. A great idea for a company party or a fun gathering of your friends! Contact our events coordinator for more information. Wedding, funeral & event deliveries within the Treasure Valley, Idaho City, Garden Valley, Donnelly, Cascade, and McCall. Please call The Florist at Edwards to arrange events outside these areas and delivery fees. We provide discounted, custom grown plant material for customers that fill out our Wholesale application, Credit application(we do provide cash accounts), read & sign our wholesale policy and provide a copy of their current nurseryman’s license. Visit our Commercial Growing page for more information.